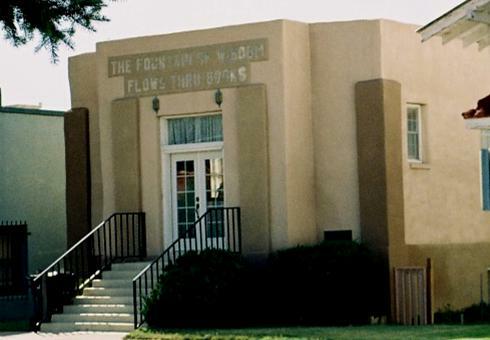 This adobe building was Carrizozo's first WPA project. Built in 1937 as a book depository to serve Lincoln County Schools, it was open to the public as a reference library and housed the County School Superintendent's office. In 1948, J. G. Moore opened an insurance agency here and during the 1980's it held law offices. It was abandoned until 1994 when Joseph and Suzi Ferm purchased and renovated it to be a private home and uncovered the words over the door - THE FOUNTAIN OF WISDOM FLOWS THRU BOOKS.